Villa Manis is a beautiful, quiet and peaceful villa, yet at the same time we could just imagine it to be the perfect venue for a wedding or a party. We spent a lazy afternoon by the pool being lavished with ice cold drinks and fresh fruit. Wonderful! The only time we moved was for our massage in the on-site spa, and then again when it was time for dinner. Being right next to a mass of rice fields is a rare treat these days, even in Pererenan, and at night as we sat on the wraparound balcony of the enormous master bedroom, all we could hear was a croaking serenade of frogs under a wonderfully starry sky. The delightful staff took great care of us and left us wanting for nothing. The chef is a bit of a genius, just quietly, and amazed us with some delicious meals. It was a real pleasure to eat at Villa Manis. The view from the master balcony is spectacular. The split-level adult and kids’ pools are a great idea, while the pool bar enhances the social experience. Having a spa room onsite is also a real treat, providing the opportunity to slip into a quiet world of relaxation away from fellow guests. We had a lovely time at Villa Manis with no unpleasant surprises at all. One word of warning though, the WC in the master bathroom is a long walk from the bedroom in the middle of the night! We stayed at Villa Manis for new year and we had an amazing experience. The view was great because of the greenery and the pool. The staff was attentive and was here for all of our needs. The help they provided for us was exceptional. The meals was amazing as well. The staff was glad to adjust to our dietary needs, we will suggest Villa Manis to anyone who plans to visit Bali. Thank for the lovely stay and for the experience and thank you to the wonderful staff. We stayed at Villa Manisfor my 50th Birthday Celebrations.18 guests of family and friends all had an exceptional experience for the entire stay. The villa staff were more than we expected and they couldn’t do enough for us. The meals and service they provided were outstanding. The villa facilities and rooms were also fantastic. We would definitely recommend Villa Manis to our friends and we will most certainly plan another celebration one day in the future. Thank you Villa Manis and to all the staff who looked after us. Villa Manis was the perfect location for our family to celebrate my mothers 70th birthday. She could not have wished for more, and felt like a princess in the master suite. Thank you for having us. We had a fabulous stay for our work conference and end of year celebration. The staff were so friendly and helpful and made our stay wonderful. We will be back again with our family. The villa is perfect and the pool is just amazing. Thank you Villa Manis. Villa Manis staff, thank you for hosting us. Thank you for your very kind hospitality, care and friendship. We have absolutely loved staying here at Villa Manis. Thank you. We had a wonderful time celebrating Bee's 40th here at Villa Manis. Great service, great pool, great location. We had a wonderful time! You all took great care of us and feed us all so well. We all can't wait to come back and stay longer next time. To the crew at Villa Manis, thank you for your hospitality for all of us to have such a memorable stay for our 25th Reunion. Thank you for an amazing stay, The service was out of this world. The best we have an experienced through all of our travels to many countries. Anything we needed and the staff helped us. Also in organizing many trips and restaurants. We leave for home relaxed and happy. We will miss you all. It has been a pleasure being here for a week. Great service, beautiful area and nice food. Great place to be when on holiday and the house are really nice. I don’t want to go. Our family had a wonderful stay at Villa Manis. The place is very peaceful and the garden is so well kept. We appreciated very much the kindness and smiles of everyone and the chef deserves a special mention. All the dishes were excellent and the pancakes are a must-have. We will for sure recommend this place. Thank you very much. Thank you for the most wonderful week that we had in Villa Manis. You have been excellent in your service to us and your smiles with live with us forever. Food was absolutely "bagus" and delicious. Our experience at Villa Manis has been great, we were well looked after by all the staff. The driver Gede was also excellent but would be good if the car was available a little later. The villa was a good size for our extended family with lots of different sitting areas. A big thank you to Riri, Mega, Putu, Dewi, and all other staff for taking care of us. The villa is awesome, the staff very accommodating and the food was delicious. The massages were relaxing and the driver negotiated the traffic with ease! We have felt like Kings, Queens, Princes, and Princesses for the duration of of our stay. We will definitely be back! Villa Manis was an amazing stay. Besides all the amazing structures, the thing I was most impressed by was the staff. They were unbelievably awesome and so kind. Just because of them I would come back a million times! Thank you for everything. Lovely 3 nights stay with 10 of us. Great break from Singapore. Thanks to all the lovely staff. The British Dragons Singapore. Sure we will come back next time. Best place, nice people and staff. Had a great stay. Thank you for everything. Pelayanan, Baik. Villa, Nyaman, Kurang siaran Bola. Best place, best people EVER, love this place. Thanks for a lovely stay. To our friendly and amazing staff at Villa Manis. Thank you for an amazing 10 days, we have had the best family holiday. Titiang Lungsur, Mapamit dumun - have some babi guling for us, Mr Wayne and the family. Thanks for an amazing time here at Villa Manis. We had a fantastic time and the staff were absolutely fabulous! We will be back. An exceptional stay in an exceptional villa, staffed by a great team. Our children will remember this for years to come! Thanks for everything. Very satisfied. I like it here, very friendly staff. My friend spent two days here, we'll come back next year. Food is also delicious. To all the friendly, helpful and amazing team at Villa Manis. Thanks for putting on a great family and friends vacation celebrating in style for Mrs B’s 50th. So relaxing, so many happy memories made here, unforgettable. Thanks a dozen. We had a wonderful time. Everyone was very attentive and the food was great. Thank you so much. Our compliments to the staff, we would love to return. To the team at Villa Manis. What a wonderful week away we have had to celebrate two 40th birthdays. Fantastic hospitality and attentive skill made all the difference. The children had a ball too. Would love to return some day soon! Best wishes from all of us. Thank you Wayan and all staff. Its been a wonderful trip in the last two weeks. All staff been very friendly and helpful. We spent a very nice Chinese new year eve and holiday here in Bali. The house and land are great. Beautiful Environment and weather. Friendly driver and kitchen staff. We will definitely stay again if we come to Bali. Thank you very much. We greatly appreciate the quality service and patience you showed our entire group. You made our wedding trip a big success. We will always think of this trip fondly. Best Regards to all. Thank you so much for an amazing stay at the villa. Food was amazing and everyone who work at the villa is very friendly and extremely helpful. We love Bali and definitely come and stay again. Once again, thanks a lot for wonderful hospitality and services provided by all staff in this villa. Our big families enjoy so much to stay here and have wonderful memories that can't be forget, thanks again. Thank you so much for an amazing long weekend. The villa is wonderful and the staff are fantastic. We love it very much, I really enjoyed celebrating my 40th birthday here. Thank you for fulfilling all our wildest dreams and weird requests! We had an amazing time which will not be soon forgotten. With much love. What a wonderful villa which became home for 4 families for the week. We had an amazing time, the food and service was lovely! The villa was a great place to relax and we love to see you all again in the future. The Hong Kong gang! Thank you for a fantastic holiday at Villa Manis, we had an amazing time at this beautiful place. We appreciate your service, nothing was too much trouble - even finding us chicken! This was the perfect way to end our festival of 40th celebrations. Thanks! To all staff of Villa Manis - you all made our stay very special, everyone was so friendly and accommodating. Not only was the villa beautiful, but employed beautiful people. Thank you. To the wonderful staff at Villa Manis - you spoilt us and made it very hard for us to go home. We will miss this place so much. Thank you for an amazing week you look after my family amazingly well, great food, wonderful hospitality and sensational house. I don't want to go home! What amazing and forever memorable week with my 8 ladies, 50th Birthday. Riri, Wayan and the whole team - we can't thank you all enough for the last 6 days here. Perfect!! We don't want to leave. See you again for my 60th!! Thank you for your friendly service and attitude. The facilities here were superb and appreciated. Thank you for the excellent food and service during our stay. Our entire family especially kids enjoyed the smiling staff and friendly people .The food was top-notch and the rooms were fantastic. Thank you for your kind and hospitality of your staff. You are the best! We want to say thank you for all of the staff for 5 days. The place surprised us!! We all like the pool very much. The environment was so good that we felt peaceful these 5 days. We all had a good time. It is hard to find such a Big Place for our family to live in. Thanks to cook for us these days and help us a lot. In addition the view is PERFECT!! Thank you again for taking care of us. Thank you for a fantastic time, your smiling faces and helpfulness was second to none. A great place to relax and appreciate all you did and will definitely be recommending you for future friends coming to Bali. Thank you again and take care. To the lovely and always smiling staff of Villa Manis - your warmth, hospitality, attentiveness and constant friendliness made our stay delightful and homely. The villa itself is beautiful and was perfect for our family of 15. The food was delicious and always served with a smile. The staff were all very helpful and lovely and their generosity inexhaustible. Thank you again for making our stay memorable. Thank you for providing us with an incredible stay in Bali. The villa has been a delight to stay at. Thank you to Wayan and all the staff for your wonderful service, delicious meals and friendliness. It has been the perfect setting for our once in a life time family vacation. We hope you also enjoyed observing our family antics and watching our weird and wonderful fun and game. It has been absolutely joy of a holiday and you have all been the reason for making it a picture perfect paradise. What a fantastic venue for our wedding and birthday celebrations.The villa more than comfortably accommodated our families and the staff were most attentive and made our stay a very happy experience. Thank you so much for arrangements, catering and entertainment for our function. We all leave with memories of our stay. Thank you and all the best. Thank you so much for such a wonderful time of our lives.The experience was magical and we are so looking forward to our next trip. Staff, food, everything has been amazing. We see you again and all the best. Fantastic stay with our group 11 people. Awesome food, loved all our meals. Staff are absolutely amazing. Will definitely stay again and will recommend to our friends. Thank you terimakasih. Thank you for all the staff. All the staff are very friendly and cooked food is very well. Villa Manis is beautiful. Maybe we will come back and see you again. Wow! Thank you! We have had an amazing time here. The villa is just beautiful and all the staff have been attentive and helpful and cooked delicious food! The villa is very well maintained and we had a very comfortable stay. Wayan and his staff were wonderful. 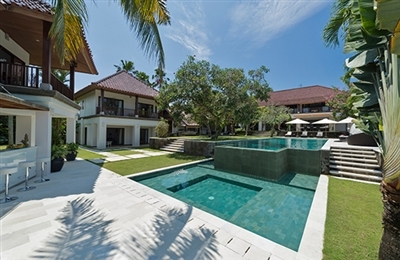 Villa Manis is based on previous comments the ideal place to celebrate 40th, 50th, 60th, and 80th birthdays. May we add to that - it is the perfect setting for our Golden Wedding Anniversary and to share with our 3 children's families from Sydney, Singapore & Salalah (Oman). With much appreciation to Wayan, Riri, and their 14 superb staff. We have had a wonderful time with Villa Manis with all our family, celebrating our 45th Wedding Anniversary. You and all the team have provided excellent service and a very warm welcome. Everything has been so special and we will remember our stay fondly. From all of our wonderful family. Many Thanks. Thanks so much to all the amazing staff at Villa Manis. You made us all feel amazingly welcome and the service was exceptional. We will absolutely recommend you to everyone we know. Thanks. Had a wonderful times at Villa Manis. Magical time, lovely staff, and beautiful setting. Thank you, Marcelle, Wayan, Riri, Mega, Eka, and the rest of the team, thank you for bringing Bali to us. We traveled to Bali and you share and give us Bali's spirit. Thank you. Thank you, we came here to celebrate my 40th birthday. What an amazing, beautiful place! To all of the wonderfull staff who went above and beyond any day to make our time here very special. We absolutely loved every moment. Not least Wayan's cocktails!!! We will be back! Dear Villa Manis Team! It has been unforgetable holiday, you guys did a great job and we appreciated everything you did for us. Hopefully until the next time. Thanks. Had a very pleasant stay at Villa Manis. Wayan, Gede, Eka & Mega and the rest of the staff were very friendly and looked after us as well. Thank you again!! We are pleased with the service provided by the team in Villa. It is a great experience staying in Villa Manis. We are from China to have wedding in Bali. Their having a good times in Villa Manis, a very nice, magical place, for enjoy our lives. Thank you for a lovely time. Great service and lovely staff. Everything ran smoothly. Great food by the chef. Beautiful view! Great villa, staff are very helpful and attentive to our need. Villa Manager is very efficient and he made our stay memorable. Thank you Pak Wayan! WOW!! What a way to make a milestone memorable! It was a dream to stay at Villa Manis. The house and views are breathtaking BUT it’s the ENTIRE STAFF that makes it so memorable and special. From WAYAN and RIRI to MEGA and KOMANG and EVERY SINGLE PERSON. ALL SMILE AND SERVED WITH A SMILE!!! I thank you so much for making My Birthday so special for me and for my 17 friends. Thank you, very delicious food! Thank you so much Wayan & staff for making our stay relaxing and wonderful. It was our first time, the staff were great, meeting all our needs. The villa is beautiful, food delicious and the service excellent. We felt safe having security around checking the villa at night. I love Villa Manis so much! The staff are wonderful and the location is perfect and gorgeous. And I highly recommend this villa. Thank you to all the staff at Villa Manis for making our holiday so wonderful. Always kind and friendly and nothing was too much trouble. Villa Manis is a beautiful place in a beautiful location. We have all had a wonderful time here as a family celebrating Anne's 80th Birthday. Villa Manis best holiday ever. Staff couldn’t of been more helpul. What an amazing 2 weeks. Thank you Villa Manis have had the best time here for my 50th Birthday with family and friends. Thank you to all the wonderful staff. Hope to come back again. I would highly recommend staying at this amazing Villa! Villa Manis what a place! Thank you for making Bob's 40th so special! We have all had a great time. Villa Manis - OMG! Whoa! What a beautiful place. Staff are amazing and nothing was too hard for them. Just soooo friendly. Catering was fantastic and our group had a wonderful time. Thank you very much. Thanks for a lovely time. Wish we could have extended. Once again we're had a spectacular holiday at Villa Manis. We plan to return here as often as we can. The staff are warm, helpful and beautiful. Best holiday ever. Thank you for hosting a wonderful holiday after our wedding. It was a truly a relaxing and comfortable stay, and an opportunity for all of our friends to catch up from all corners of the world. Your caring nature and smiles will always be remembered. The villa is so beautiful and amazing. The staff are incredible and provided an experience for us. This has been an unforgettable experience. We will be back very soon for sure. Thank you so much! We love it. Such a beautiful place. The staff are amazing and we will definitely be back again. 2 nights was not long enough! It has been an absolute joy and pleasure to have spent our time in Bali with you at your wonderful villa. You have welcomed us with your friendly smiles and gracious hospitality. It has been wonderful to stay with our new Bali family. Thank you and all our love. A truly memorable weekend in a stunning villa, with excellent staff and fantastic grounds. We celebrated a 40th Birthday whilst here, which mean 14 staying here and a further 6 guests every evening, and everything went smoothly. All of the guests had a brilliant time and most importantly, the birthday girl had the time of her life. Many thanks to the staff. Villa Manis Staff - so many thanks for making our Reuni, Birthday, Engaged Celebrations!!! You've been thoughtful and so helpful. We loved our stay! Thank you Villa Manis for a memorable stay, we enjoyed ourselves from the stay. Our main reason for a family holiday is for family bond and fellowship and we can say that after this holiday together we know and understanding each other better. Thanks for the helpful staff for their help and service. We enjoyed our stay very much and made many special memories here. We will come back again one day. Thanks to all the staff at Villa Manis. Thank you for a fantastic, Relaxing time in Bali! Awesome staff @ Villa Manis. It was a pleasant 3 days stay here! The staff were very happy to serve and were very helpful. It was a wonderful stay! Special thanks to Diana and Riri for going out of their way to accommodate our needs! Villa Manis holds very special moments and memories for this special week in Bali. 19 friends flew across the world from Germany, Hong Kong, San Fransisco, Australia and China to celebrate one man - Thirty 30!!! New friendships blossomed - laughing till our stomachs ached, crazy nights into the moonlight, champagne showers, delicious barbecue, chilled afternoons by the pool. Only good vibes and smiles flowed through Villa Manis. All with the help of Diana and the amazing hospitality from the staff, your kindness made the stay even more enjoyable! Thank you from the bottom of our hearts! We do had a very good time here. Thank you for tending to all our every needs and cooking for us! Thank you for the wonderful stay! The villa is amazing. Our family had such a great time! Very professional. We LOVED the pool and the entertainment room. Thank you to all the wonderful staff that took such great care of us these past 2 weeks! The service, food and entire experience was unforgettable. So thankful and grateful for everything!! Thank you Villa Manis and crew. You turned our serious team meeting into a fun memorable one and also relaxing! We had an amazing time at Villa Manis, the Villa is beautiful and very well maintained. The staff went out of their way to do all they could to help us and they were very attentive at all times. Any issues were swiftly attended to. The food was amazing, we were very happy with our stay and would highly recommend. We were a group of 21 people and we had lots of space to chill out and especially enjoyed the pool. Perfect big Villa to host our family of 18 for a week and to hold our beautiful wedding. The staff were so attentive, hospitable and treated us like family. Very clean and has all the facilities we needed. We didn't want to leave :( The setting looking over the rice field was stunning. The menu had lots of options to suit everyone, delicious traditional Balinese food along with Western food. Hopefully one day we'll have the chance to return. Fantastic, Superb. Property, Staff, Service absolutely excellent. I had the best 50th Birthday. The villa was in excellent condition and perfect for our group size (11 adults plus 2 helpers plus 3 kids plus 1 infant). The pool was huge and the spa room and gym were a bonus. The villa staff were exceptional - friendly, responsive, and helpful with the kids. The chef was amazing - our food (both local and western menus) was always delicious. We will definitely come back again. Thank you!! Very happy with the Villa and the service we received. Would definitely recommend. based on 95 user reviews. Villa Manis is a beautiful, quiet and peaceful villa, yet at the same time we could just imagine it to be the perfect venue for a wedding or a party. We spent a lazy afternoon by the pool being lavished with ice cold drinks and fresh fruit. Wonderful! The only time we moved was for our massage in the on-site spa, and then again when it was time for dinner. Being right next to a mass of rice fields is a rare treat these days, even in Pererenan, and at night as we sat on the wraparound balcony of the enormous master bedroom, all we could hear was a croaking serenade of frogs under a wonderfully starry sky. The delightful staff took great care of us and left us wanting for nothing. The chef is a bit of a genius, just quietly, and amazed us with some delicious meals. It was a real pleasure to eat at Villa Manis.